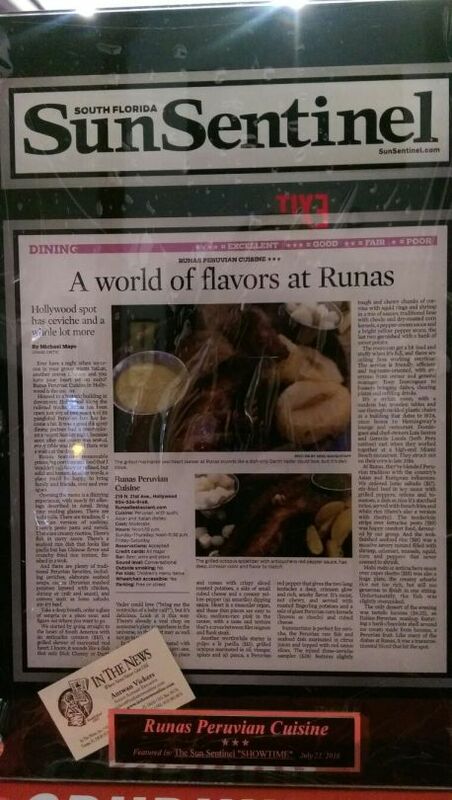 When Runas Peruvian Cuisine first opened I raved–telling anyone who would listen that Hollywood had the hit big time with this over-the-top foodie-fusion gem! Well, the praise certainly hasn’t stopped with me (see Yelp,Trip Adviser and New Times). Just last week the Sun Sentinel checked in with a sterling review. Thanks to Tony, Gerardo and Luis for their support of our Art Extravaganzas vis-a-vis their contribution of Hemingway’s Lounge for exhibits and performances!